Summary: Microsoft Scripting Guy, Ed Wilson, talks about using Windows PowerShell to configure a scheduled task. Microsoft Scripting Guy, Ed Wilson, is here. This morning is a coffee morning. I don’t have a lot of coffee mornings, but occasionally I break down and desire a raw coffee jolt. When I do, I use my French press, some spring water, my rotary bean grinder, and usually some sort of special beans. Usually, that translates into a nice Kona bean. It seems to take me nearly a half hour to make a decent cup of coffee. Luckily, I can almost do it in my sleep—which is a good thing. Because I do not make much coffee, I feel no need to automate the process. But if I did, I would probably invest in one of those big programmable machines. I would sync it with my alarm clock so the coffee would be available for me when I wake up—sort of like a nice hotel with someone who brings coffee or hot cocoa to your door with your wake-up call. After a scheduled task is created, there are still many configurable items. Luckily, I can use Windows PowerShell to make these configuration changes. Even better, introduced in Windows 8 and Windows Server 2012, there is the Scheduled Task module that makes these changes a breeze. 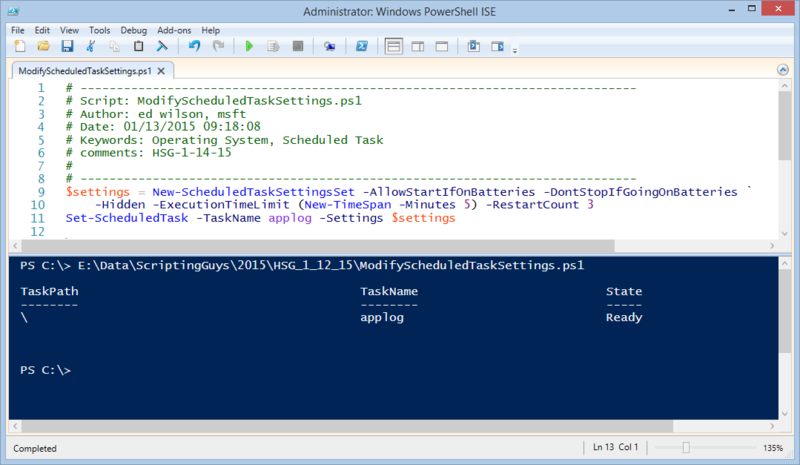 Note See yesterday's post, Use PowerShell to Create Scheduled Tasks, for a basic introduction to scheduled tasks and the Scheduled Task module. That is it. Two lines of code really. Pretty cool. When I execute the script, it provides a minimal amount of output, but it does not echo the new settings. Here is what the script looks like after it runs. That is all there is to using Windows PowerShell to configure a scheduled task. Scheduled Task Week will continue tomorrow when I will talk about more cool stuff.